The Limited Express Dinostar is a service operated by JR West that runs between Kanazawa Station and Fukui Station. The name “Dinostar” is a mixture of the English words “dinosaur” and “star”. This name was chosen because Fukui Prefecture is famous for having Japan’s only Dinosaur Museum, and the word “star” symbolizes the hopes of the people of Fukui Prefecture. This service was introduced in March 2015, to coincide with the extension of the Hokuriku Shinkansen line to Kanazawa Station. 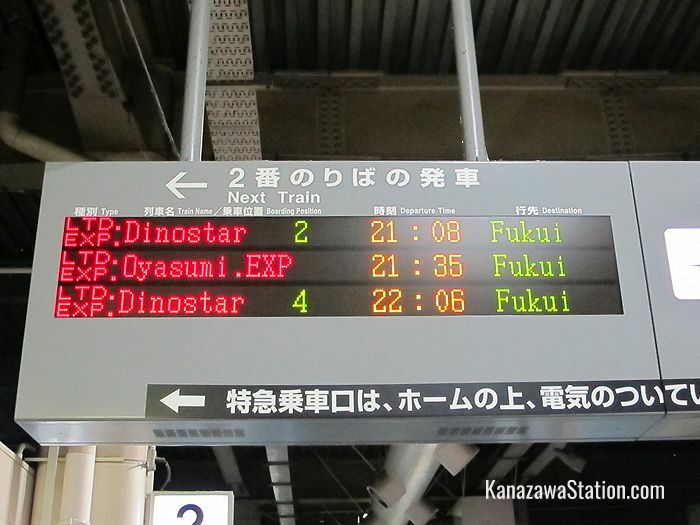 The Dinostar service is intended to provide a link between Fukui and stations beyond Kanazawa that are now served by the Hokuriku Shinkansen service. It is a supplementary service to the Thunderbird and Shirasagi limited express services that also run between Kanazawa and Fukui. Three Dinostar services bound for Kanazawa depart from Fukui Station each morning and three services bound for Fukui depart from Kanazawa Station each evening. 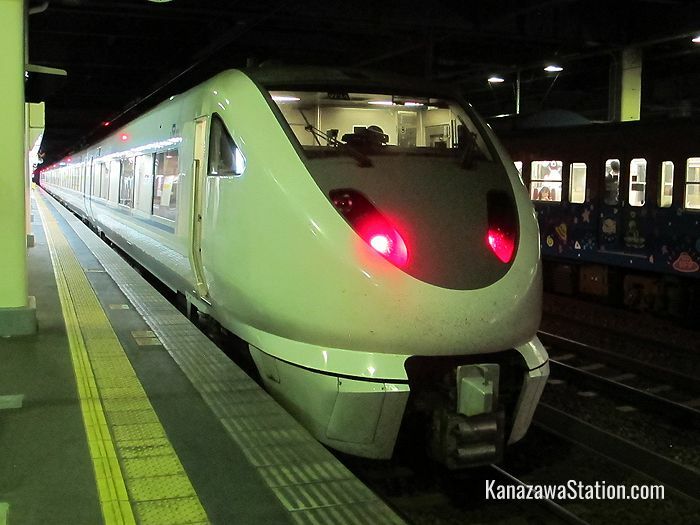 At Kanazawa Station these trains depart from Platforms 1 and 2. This service is fully covered by the Japan Rail Pass. The Dinostar stops at the following destinations. Train times vary according to the service. 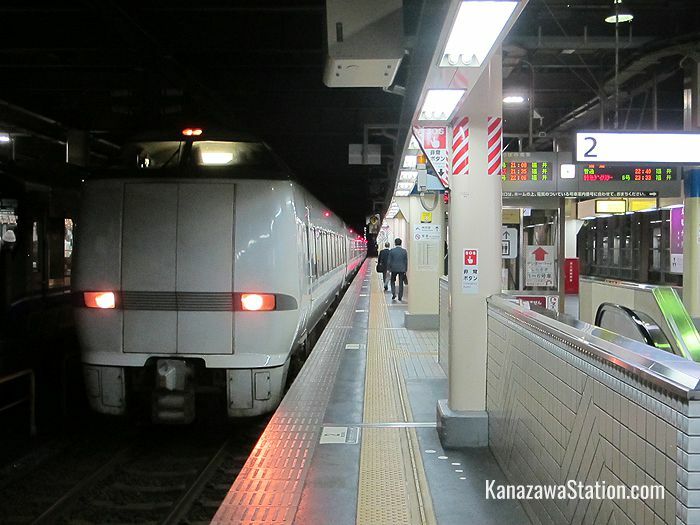 Train fares and example train times given below are from Kanazawa Station. Komatsu’s many attractions include the Motorcar Museum of Japan, Ishikawa Aviation Plaza, the crafts village of Yunokuni no Mori, the hot spring resort Awazu Onsen, and the ancient Hoshi Ryokan, a traditional inn which was founded in 718. Kaga is a large sprawling city that includes within its official boundaries many smaller towns, among them the famed hot spring resorts of Yamashiro, Yamanaka, and Katayamazu. Check the Kaga & Hakusan website for recommended hot spring facilities. Natadera Temple is also a short bus ride from Kaga Onsen Station and is worth a visit for its gardens and its commanding views of Mount Hakusan. The city of Awara is famous as a hot spring resort. Check the official Awara City website for a list of recommended hot spring facilities. Fukui is the capital city of Fukui Prefecture. Its famous sites are the Ichijodani ruins (a partially reconstructed 15th century castle town), the Zen temple complex of Eiheiji Temple, Fukui Fine Arts Museum, and in the spring the 600 cherry trees that line the Asuwa River. To get to the Fukui Prefectural Dinosaur Museum take the Echizen Railway to Katsuyama Station. The journey takes around 53 minutes. If you don’t have a Japan Rail Pass, you might consider investing in a Hokuriku Area Pass, to fully explore the Hokuriku area. To find departure times quickly and easily use the JR West Timetable and Fare Finder.